Being an eco-conscious parent often means taking a look at the footprint of all the baby gear we are told we just have to own in order to properly raise our children. Sometimes this means finding greener choices (like cloth diapers instead of disposables), sometimes this means using hand-me-down onesies from your older sister, and sometimes this means opting out altogether from purchasing things that will become quickly obsolete. When reducing your “baby footprint,” consider whether or not you really need a stroller. Strollers are expensive, use a lot of fossil fuel resources and generate a lot of toxic waste from manufacture, to packaging and shipment to your local store, all the way to their final resting place in the landfill after they inevitably wear out. Not only do strollers have a large ecological footprint from cradle to grave, but they may not be very good for your child’s development either. Recent studies have shown that strollers in which your baby faces away from you could risk long-term development problems in your children. For most of human history, there have been no strollers, nor any heavy “baby bucket” carseats to lug around. Even today, most of the world’s parents use cloth wraps of various types to wear their babies on their bodies. In the last couple of years, many Americans and Europeans have returned to the practice too. 1. Babies who are carried often cry less. A 1986 randomized, controlled study by Hunziker and Barr showed that carrying an infant 2 additional hours per day reduced crying overall by 43%, or one entire hour. 2. Babywearing is good for babies physically. According to Dr. Eckhard Bonnet in a 1998 article published on Didymos, a baby wrap or sling holds a baby’s body in a comfortable, correct position, much as the womb carries a fetus before birth. Upright carrying also massages your baby’s abdomen which promotes healthy digestion, and prevents physical abnormalities associated with infants who spend large amounts of time lying on their backs or bellies (such as hip dysplasia, frog legs, or flattened skulls on the back or sides). 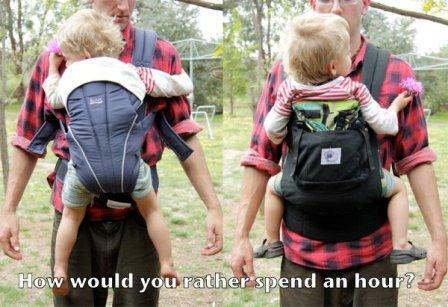 Note: The exception to this are the baby carriers that dangle your baby from his crotch. These facing-out types of carriers (Baby Bjorn and others) are harmful to the development of your child’s hips. See below. 3. Babywearing encourages healthy mental and emotional development. Since in-arms parenting meets your baby’s needs for warmth, comfort, and access to breastfeeding, babies cry less and spend more time in a quiet, alert state. While in this state they are better able to learn about their environment and develop mentally and socially. As long as you can carry them, toddlers also enjoy being worn, and benefit greatly from interacting with others at eye-level instead of being looked down upon in a stroller. 4. Babywearing makes parenting easier. Carrying baby in a sling, wrap or pack frees your hands to work, or assist in the needs of older children while still being able to give your baby the closeness she needs. Many slings also allow for breastfeeding while on the go. If yours is the type of baby that needs to be held during naps, like mine was, doing it with a baby carrier allows you to get some work done, or to do almost any other activity. Babywearing allows you to bond with your baby and learn to meet your child’s needs more quickly. Babywearing also helps mothers who may be suffering from depression to nurture their babies with less effort. Preemies and sick infants also grow and heal faster when worn, especially when the baby and parent are skin-to-skin. This is sometimes called “kangaroo care,” and is increasingly practiced in hospital neonatal intensive care units. No wonder more and more Western parents are babywearing these days: It should be no surprise that what has worked for parents for thousands of years works just as well when adapted for modern times! There are many types of slings and carriers available to meet a variety of needs and preferences. Some of them are beautiful works of fashion art any new mom would love to wear, and there are gender-neutral carriers for Dad, too. Your first consideration should be how the carrier was manufactured and what materials were used. Look for non-toxic dyes and materials that weren’t treated with flame retardants or other textile chemicals. Your baby will spend a lot of time close to, or even chewing, the fabric. The legs should be at least pulled up to a 90 degree angle and supported behind the leg. This is only possible if the baby sling crotch piece is wide enough so that it will reach to your baby’s hollow of the knees. The back of the carrier needs to support the baby’s back, so that he or she is not slouching excessively while in the upright position. It needs to be supportive enough that even when your baby is asleep his/her body is tightly secured to your body. The back of the carrier needs to reach over the baby’s head, on all three sides, to keep the head from falling backwards or sideways. This is very important as long as the infant can’t keep his/her head up. As your child grows larger, this is important only when he or she takes a nap. Make sure the head rest is sturdy and doesn’t fold back when pushing on it with your hand. Carriers supported by both shoulders with wide straps are best to prevent back problems for yourself. Carriers that are only supported by one shoulder often worsen the slight scoliosis that most people have. Your baby is growing fast. Most baby slings are outgrown by 3-9 months. Choose one that will grow with your child. A carrier that adjusts well can also be used by multiple adults in the family who might have different heights and weights. Only choose a baby carrier that allows your child to face you—never out. Not only does a child need support to hold the leg in a 90 degree angle, but when facing out, a baby has no way to exclude himself from a busy or overstimulating environment by turning his head away and towards you. Healthy sleep is difficult for a baby who is facing outward. Many carriers are made of Nylon. Find one that allows airflow to reach your baby. Any non-breathable fabric will encourage a rash on your baby’s skin when being carried in hot weather or for an extensive period of time. When carrying the baby in an upright position, the baby’s hips should always be straddled around your body. The legs should be pulled up at least to a 90 degree angle. When the baby’s knees are pulled up to a 90 degree angle, the baby’s legs are spread between 90 and 120 degree angle around the wearer’s body. This agrees with the baby’s anatomical make up and supports proper hip development. Most importantly, babies should not be worn facing out. From the time my baby was a newborn through her toddlerhood, we primarily used an ErgoBaby structured carrier to carry her everywhere, because her father, grandmother, and I could all wear it comfortably and interchangeably. It even worked for easier piggybacks when she was 4! I also used a beautiful, silk ring sling for quick trips and “dressy” occasions. Between the pack and the sling, I was able to do almost anything I wanted with free hands while still minding a colicky baby who never, ever wanted to be put down, especially to sleep. Some Baby Carriers are Dangerous! 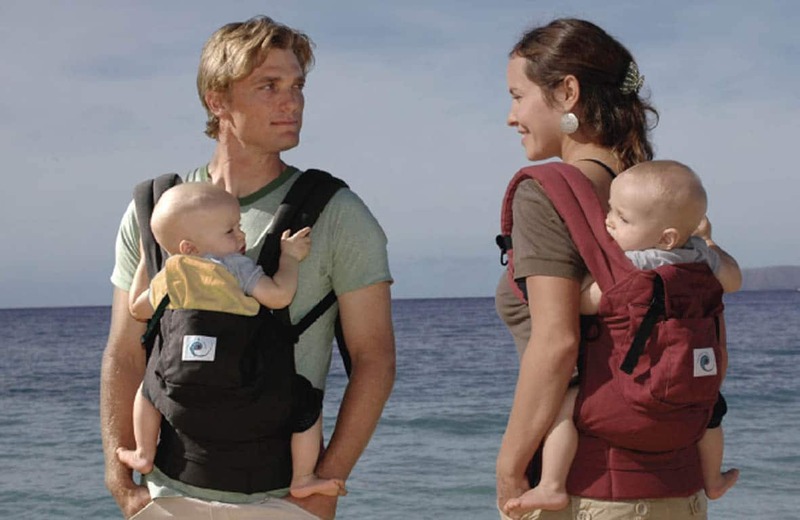 Popular front packs like the Baby Bjorn, Infantino or Snuggli (Yeah, I’m naming names.) have narrow seats that encourage bad positioning for your baby, and can even cause hip dysplasia, scoliosis or spondylolisthesis with prolonged use. Sometimes disparaged as “baby-danglers,” front packs with narrow seat areas essentially place your baby’s body weight on his or her crotch (instead of being in the desirable “frog” position), which is very unnatural and extremely uncomfortable, and can damage a baby boy’s developing scrotum. Dangling legs also encourage the ball of the femur out of the hip socket with every stride you take, fostering dysplasia. Front packs also dangle baby in a position that pulls their weight down and away from you. This throws off your center of balance and means you subconsciously compensate by leaning back a little, which can quickly lead to back strain and discomfort. The straps of these types of front packs are also often thin, digging into your shoulders and back, and very few brands use a waist belt, which would take some of the weight off of your shoulders. For all these reasons, front packs tend to get very uncomfortable after your baby gets to be about 4 months old. For the amount of money you pay for a “baby-dangling” front pack, you would be better advised to invest in a decent baby carrier that you will get years of use from that will be comfortable and safe for you AND your baby. Safe, quality baby carriers can increasingly be purchased at retail stores, but you can find a much better selection online. My favorite online stores include PaxBaby and Tadpoles and Butterflies. There are also many online groups, forums and local clubs dedicated to babywearing that can help you out. So, unless you have multiple babies, are an athlete who runs with your baby, or are physically unable to carry your child on your body, why not enjoy all the ecological, developmental and practical benefits of wearing your baby? You could save between $200-$700 by not buying that stroller, and feel great about preventing all the pollution and loss of natural resources that goes into producing, packaging, shipping and disposing of them. I love baby wearing while shopping or at the zoo. People look at me and smile and say “how cute” or “what a good idea” or “he is so happy looking”. I think I am often the only mom they have ever seen wear their baby. Odd. I always tell them to try our a wrap or sling. Happy baby wearing! I love the idea of babywearing and want to do that with the rest of my kids. But I also don’t think I could do it all the time. My husband and I share a car, so I run a lot of errands with my kid in the stroller. It allows me to transport bags of heavy groceries, packages from the post office, etc. without us having to buy a second car. I also run/walk 4 miles a day, and couldn’t do it if I wore my kid. So for my one-car family, waste generated from a stroller is a loooooot less than waste from a car! But this article just motivated me to sell my Baby Bjorn, get a proper sling, and wear my kid for the non-errand outings we do. Thanks! Indeed, a stroller is a vast improvement over a second car, especially if you can find a quality second-hand model. And you manage to get some exercise too? I’m impressed, mama! 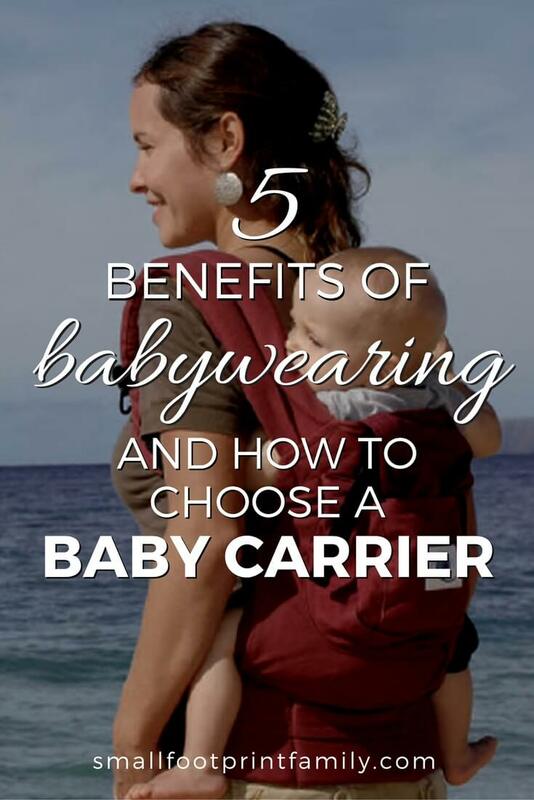 If you can, try a few baby carrier styles before you buy, so you find the right one for you before you invest the $$. Some mothers find that a ring sling vs. a backpack/mei-tai feels very different on your back and neck, especially when carrying your little one for a while. Some moms/kids love slings; others can’t stand them. For a mom on the go like yourself, you may prefer the comfort and mobility of a soft-structured backpack like the Ergo or Beco, but it’s always good to borrow a few if you can (or join a babywearing support group in your area) and see what works for your child and your posture. Yes! I agree with it all except your final paragraph “unless you have multiple babies”. The Moby wrap has a “twin carry” position, and just today I was at a meeting with a mother carrying twins: one in a baby carrier, one in her arms. Gotta be easier than carrying both in arms and having no hands free! Toddler-wearing and child-wearing has great benefits too: It’s wonderful for staying connected to your child, helping them learn social skills (being up at adult height), and preventing tantrums. See http://www.naturalchild.org/guest/claire_niala2.html . I’ve seen people carrying two in a Moby, but I myself could never do it. I could barely carry my own singleton for the 10-12 hours a day she insisted on it, and now at age 4, I can barely pick her up at all. When I wrote that, I was thinking of moms like me who couldn’t handle the weight, or who have more than 2 kids. If you can do it, I say, GO MAMA GO! Very informative! Thanks for sharing with Healthy 2Day Wednesday; come back next Wednesday to see if you were featured! I love babywearing, too!! I did it with both of my children, the youngest being 5 months old now. I tend to agree that I much prefer wearing my babies vs. the stroller; my most precious memories are with them sleeping on my chest. However, I’m not sure that the stroller has no place at all with the everyday person. There are times when I am just tired, or I know I will be carrying a lot of things on our walk, and that’s when the stroller helps out. I still get out, and I’m not resorting to using the car. Would you consider the option of buying one used and then selling it when you’re done? I find I use my stroller about 25% of the time, while wearing her the rest. I love that you found that it worked for you all the time, though! Very informative post, thank you! I love this. I’ve only met a real babywearer in my town once! The only thing about babywearing I didn’t like was all the questions/attention I received. I’m passionate about it, but I’m still an introvert. Great post! Thanks for being so firm about the risks (and discomfort) of carrying a baby by the crotch; I wince whenever I see that. 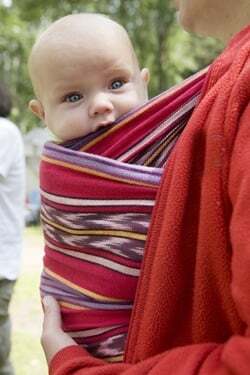 My son is 7 now, but when he was a baby we loved the Maya Wrap sling. I never even tried the stroller until he was a toddler and I hurt my back–and then I found that using the stroller changed his behavior and our relationship much more than I would have predicted! I think that being able to see my face and feel every step and pause helped him learn about pedestrian safety, among other things. The first time he walked outdoors on his own feet, he got to the corner and stopped and looked around! The only times he EVER has started into the street at a dangerous moment were when cars were doing something they shouldn’t (running a red light, turning without signaling, etc. )–he doesn’t act oblivious of traffic the way many kids do. Nancy, based on your picture you can’t possibly be that old! I was born in 1973 and was carried in various carriers, so “they” did make them then. I bet they were less well publicized, though. I’m a runner, so having a jogging stroller was a must-have for me, but you make some good points about the baby wearing. I love to wear my baby! It’s so much easier than toting a stroller everywhere, it keeps them warm, and mine tends to sleep much faster and longer than in a stroller. My baby is only 2 months old, but I love wearing her. I think it made the adjustment to becoming a parent easier, because I was able to go about my daily business around the house and out with her. She is always cuddled close and is learning about the world with me! I agree that babywearing makes life with a baby so much easier, and I’ve yet to see a baby that didn’t like it! Thanks for sharing your experience! Wow! what a lot of great info. my babies aren’t babies anymore, but I never could figure out the Baby Bjorn thingies, guess it was a good thing, since they aren’t good for them anyways! Wow this is so complete and informative! And that photo of the two carriers and different seating positions- ouch! This is quite a change to go 100% no strollers but I definitely see the investment to make a smaller footprint and the benefits to the baby himself is great. Thank you for this information! Oh I love this topic. We are “wrap” people.. moby and others. And now have an Ergo (Bunny is 2 years old) I can hardly wait for “new baby” to get here so I can start wearing her!!! I am going to go check out you store. Oh and I wrote a blog post about babywearing back in 2010. I love looking back on the pictures!! I remember those baby wearing days. I wore 4 out of 5 kids. I didn’t know anything about it when my oldest was born. However, when the next one was born, we were babywearing, cloth diapering, co-sleeping and breastfeeding like no one else! Love this post! I had a wrap carrier (gypsy mama) that I absolutely LOVED!!! It’s a simple 5.5 yard piece of cloth fabric, but I thought it was better in all aspects than the ones in the store with more pieces, parts, and packaging. It was better for the whole family. Thanks! A simple wrap is the most commonly used baby carrier in the world, and when Babyzilla was tiny, a Moby wrap was my favorite carrier too. I love babywearing and am still wearing my almost 2 year old, though only down for naps and bedtime, but boy do I cherish those moments! Thebabywearer.com is a great resource! Saw your Twitter link to this! Great post! I wrote one on the exact same thing this week! I’m going to edit it to include a link to you. Great info!